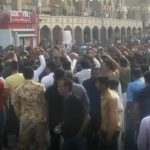 On Friday, May 18th, NCRI-Iran.org reported on the plight of protesters in Ahvaz. Hundreds of Ahvazi Arabs are still in detention a month after mass arrests in Khuzestan province in Iran. The protesters are being held without trial, and their future is uncertain. 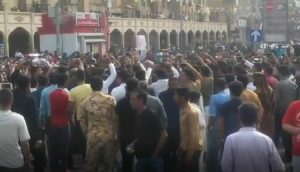 Protests broke out in Ahvaz last month after a television program on state-controlled media led ethnic Arabs to believe they would be expelled from the region. People protested the program with weeklong demonstrations and rallies in Ahvaz and across Khuzestan province. The regime responded to these protests with mass arrests. Human rights activists estimated the number of people arrested at 500, though no official numbers have been released. The regime’s Ahvaz MP did confirm that arrests were made, but he estimated that only 150 were detained. Many of the families of detainees have gathered in front of the prison where their children are held and in front of government offices to protest their detention without trial. Protests have continued to take place since the uprising that began at the end of last year, despite the regime’s attempt to suppress dissent. The MEK had a large role in organizing the uprising, and the people responded with a cry for regime change. Despite mass arrests, protests continue to occur across Iran. Reza said he was shocked and could not resist. Reza was taken to an unknown detention center with 200 other people, where they were held in appalling conditions until the next day. He said that there was no room to sit down and the center had a foul smell. The taxi driver was finally released on a 110-million-toman bail after 22 days and taken home by his family. Those who dared to seek answers about the detainees were arrested as well. Saeed Fakhernasab, the former head and deputy head of Shadegan and Ahvaz district one education departments and prominent Ahvazi civil rights activist, was arrested after meeting with members of the regime’s Assembly of Experts, MPs, and high-ranking officials of the regime in an attempt to have the Ahvaz protesters released. He was finally released on a 500-million-toman bail after he had to be hospitalized. He remains on bail until his sentencing. The activist went on to say that many of those arrested, like the taxi driver, had not participated in the protests. Some of the detainees were arrested by high-ranking officials hoping to settle scores with activists.